Most Brits think that Russia is blanketed in freezing snow and ice for much of winter. Many were the stunned when the Kremlin decided to host the Winter Olympics in a sub-tropical paradise, unaware that such a place existed in Russia. 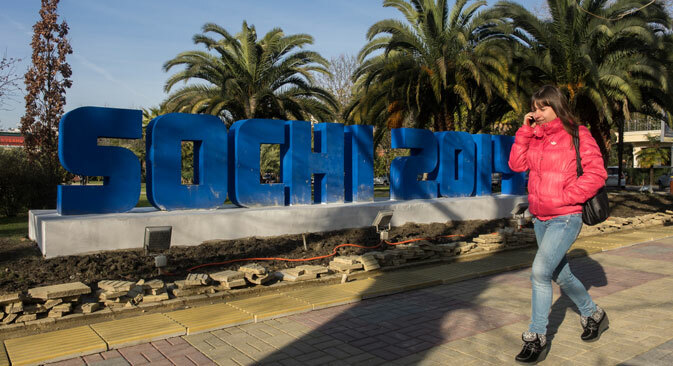 Bryan MacDonald reckons that attracting the games to Sochi was part of a grander plan. Palms, sunshine, the sea, and I’m enjoying an al fresco vanilla milkshake at McDonald’s. Looking out upon Adler beach, there’s a volleyball game in full swing and not a fur coat in sight. This isn’t California or Tenerife, it's winter in Russia. While the ordinary temperature in January Moscow is -10 degrees and a chilly -40 degrees in Yakutsk here in Sochi it’s just around 8-10 above zero. Bang goes another widely held pre-conception about this vast country. No, not all of Russia is bone-chillingly cold in winter. It is also clear that British lads are huge fans of ladies' beach volleyball, or at least of the players. A group of Londoners have their eyes fixed on the action with the same intensity of a Belieber who's just seen Justin walk out of the water. About a mile or so south lies the Olympic cluster, created for the 2014 extravaganza. It doubles as the home of the Russian Formula 1 Grand Prix and its Fisht Stadium will host matches at the 2018 FIFA World Cup. When the world first learned that Sochi was Russia’s choice for hosting the games much mirth was generated, now the city is becoming a sporting mecca. When the Olympic site is not in use for sporting events it's possible to drive sections of the F1 circuit, great fun - even in an Audi saloon. Whatever the rights and wrongs of splurging $51 billion (£32 billion) on a city only a small percentage of Russians have ever visited - and most are priced out of - today's Sochi is a modern marvel. The idea that post-Olympic Sochi is a ghost town is something dreamed up by news editors in London or Moscow who have not been in town since the Olympic flame left. I wish there was a little truth in it because attempting to drive downtown any afternoon, enduring traffic jams that could rival parts of Los Angeles, is no fun at all. By comparison to Moscow it's not busy, but it's more hectic than any Spanish seaside resort I've experienced in winter. Sochi is growing rapidly as thousands of Russians migrate from chillier regions. In fact, trying to locate a native is often a challenge. Some locals resent the ‘colonisation’ but most are sanguine as economic prospects mushroom. The current official population is 415,000 but anecdotal evidence suggests it is 10-15pc higher, not counting seasonal holidaymakers. Travelling to Russia in winter usually involves stocking up on warm coats, scarves and gloves. You'd boil in such kit here. The only scarves are worn by supporters of HC Sochi, the local KHL ice-hockey club. Clothing suitable for London in May or September is more the fashion. Of course, winter sports are available at Krasnaya Polyana, home of the Olympic outdoor events. The alpine resort is 59km (36 miles) from the city centre, which sounds excessive until you realise that Sochi is over 105km (65 miles) from north to south. My aim was to escape the big chill. After experiencing three Siberian winters, the novelty had worn off. There's something pretty amazing about walking around Russia in December without having to first dress like an Eskimo. Sochi is a sprawling metropolis akin to many American conurbations, albeit with excellent, German-style public transport and frequent suburban trains. Uniquely for a large Russian urban area, there are no trams or trolleybuses. The nightlife around Nesebrskaya Street offers copious options. At Bar London, the Muscovites at the table opposite are quaffing as if they were oligarchs, indulging in bluefin tuna with Kamchatka crab and rocket (priced at £110 a kilo) and washing it down with 25 year-old Chivas Regal (£48 a 40 ml shot). I settle for Kronenbourg, a snip at £3.05 for half a litre. Desperate for a pint of the black stuff, I find Guinness at Irish Pub. I can't resist asking the barman how they came up with such an original name. “There are now six Irish pubs in Sochi but we were the first and we are still the best,” he deadpans. After its facelift, Sochi is a tourist hotspot the equal of anything in Europe. Before the rouble's recent nosedive it was seen as a pricey destination that scared off foreign travellers. Now there are a lot of Europeans here, notably Germans and Brits lured by Krasnaya Polyana's winter sport charms. Wealthy Russians are also flocking, priced out of Florida and southern France. Russia has succeeded in creating its own coastal Shangri-La, with the best elements of Marbella and St Moritz rolled into one. Odd to say, but this is the real legacy of the 2014 Winter Olympics. At Sochi airport, a man comes through the arrivals gate straight off a flight from St Petersburg. Dressed in Arctic gear, his waiting friend exclaims: "Lyosha, where did you think you were going? Russia?" Sochi is that kind of place.